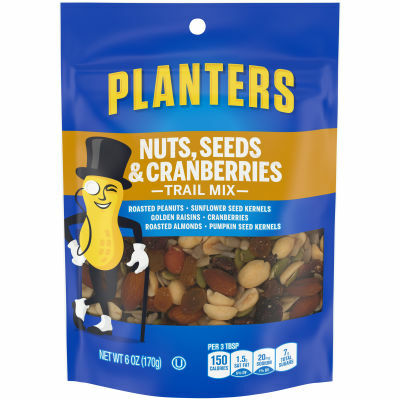 Nuts, Seeds, and Cranberries Trail Mix - Planters Nuts, Seeds & Cranberries Trail Mix is a wholesome trail mix that combines peanuts, sunflower seed kernels, golden raisins, almonds, dried cranberries, and pumpkin seed kernels that help satisfy your hunger and give you energy. A Healthy, Filling Snack - This trail mix tastes great and has a variety of healthy nutrients. Eat it at home or on the go as a quick snack whenever a cravings strikes. This package contains one 6 oz pouch. Serving size 3 Tbsp (29g).